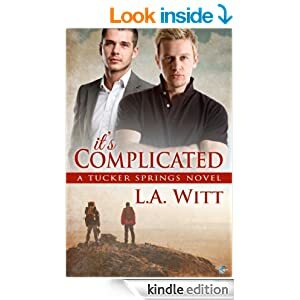 My second visit to Tucker Springs, and it was great to see more of Nathan and Ryan, I loved their story. So – what a nightmare for any couple, when one partner finds out he’s made his ex pregnant, from a one night, impetuous fling when they were on a break….but when your partner is another man just think how he feels. Poor Brad is so in love with Jeff, but they seem to be in a rut of rows, breaks and reconciliations. He’s already jealous of Jeff’s ex Christine, they share a business and have to work long hours, and lets be honest – who wouldn’t have that momentary doubt in that situation, even if you do think you trust the other person…then poor Brad’s worst nightmare comes true with the news of the baby. He’s insecure already, Jeff won’t commit yet to marriage or adoption with him, and yet Christine has had the marriage, though they’re now divorced, and with a child on the way there’s another tie to her that makes him feel further down the list of priorities. They’re a great couple and I really felt for Brad. He loves Jeff, but his jealousy is understandable to me….and then of course it seems as though its vindicated, just at the moment they’re attempting a reconciliation. I felt Jeff could have been a bit more understanding – he seemed to feel that Brads jealousy was unfounded, and it appeared to irritate him when it was mentioned, but anyone working long hours, often into early morning, would create friction with a partner. Then Christine says she’s moving to Denver to be closer to her family. That leaves Jeff to decide if ferrying a child back and forth is a solution, something both are worried might prove difficult for them and the child, and which still leaves him with even more time restraints. It means he’ll be working even longer hours covering Christine’s time too, and already his hours are a source of friction, or should he move himself and the business closer. Where does that leave Brad though – feeling lower down the line than ever 😦 Jeff won’t seek professional help though Brad’s keen for them to see a counsellor, he feels it will help them sort out the problems they already have, let alone this new hiccup. Jeff is adamant he doesn’t trust them, tried that with Christine and he feels that made they situation worse. I think he’s being really unfair, and his intransigence doesn’t help reassure Brad that he’s a priority. You can say all you like that you love someone but when there are problems action is needed too, and only Brad is willing to take that it seems. Its a story full of questions to which there don’t seem to be answers, whichever way they move someone is going to be left unhappy. I puzzled over different solutions but couldn’t come up with any if things stayed as they were, but L.A. As always finds an answer that fits perfectly and though its hard work everyone is happy. Stars: Four, great read. I was a little edgy after the pregnant ex angle but its a one night, unintended time, when they were both stressed after working late and he and Brad were on a break so not cheating as such. Though that adds to some books, there were already enough problems for them to deal with and that really would have been a step to far IMO.